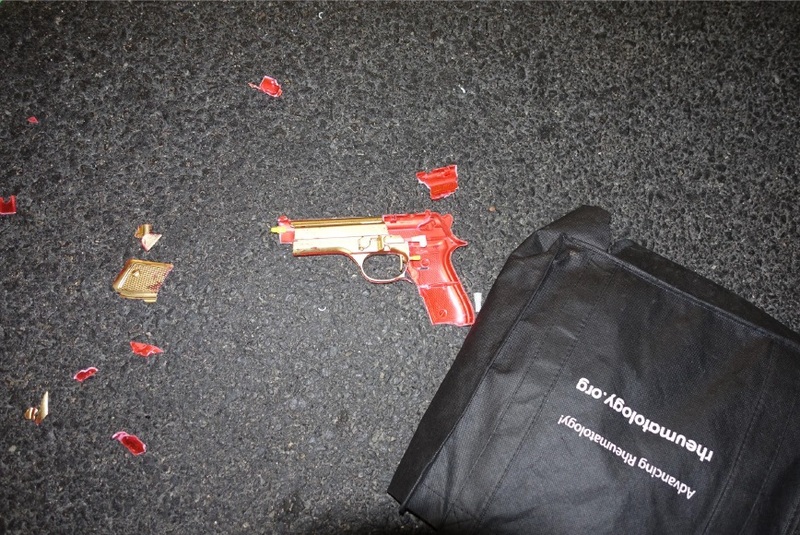 The replica firearm recovered by police, which matched the “gold color” description given by a victim, was found by officers on the street after the suspect was taken into custody and appears it had been ran over by a car, according to police. Photo courtesy of LBPD. A Long Beach man arrested Sunday for allegedly pointing a fake gun at motorists will be assessed by county mental health officials before his case moves forward after his attorney raised doubt about his client’s competency during an arraignment Thursday. Joel Webster Peterson, 42, is charged with brandishing a replica firearm in a threatening manner and resisting, obstructing or delaying officers in the performance of duties. If convicted of all charges he faces about 18 months in jail. Peterson was arrested by Long Beach police Sunday night in Belmont Shore for walking in the middle of the street and pointing a handgun, later discovered to be a replica firearm, at passing vehicles, authorities previously said. When he resisted arrest, officers subdued him with less than lethal tools and a K-9. The case was initially reviewed by the Los Angeles County District Attorney’s Office but then referred to the city prosecutor’s office after determining there was insufficient evidence to charge Peterson with a felony-level crime, City Prosecutor Doug Haubert said. Peterson also faces a probation violation in connection with an unrelated case where he was convicted of stealing bicycle parts off a locked bicycle near Belmont Brewing Co. at 25 South 39th Place. He pleaded no contest to theft on February 14 and was ordered to serve 60 days in county jail and serve three years on probation, which included an order to stay at least 100 yards from the location of the theft, according to Haubert. Peterson faces four months in jail for the probation violation. Peterson is expected to return to court March 14. The case is being handled by Assistant City Prosecutor Randall Fudge who was recently appointed as the Neighborhood Impact Prosecutor for Belmont Shore.